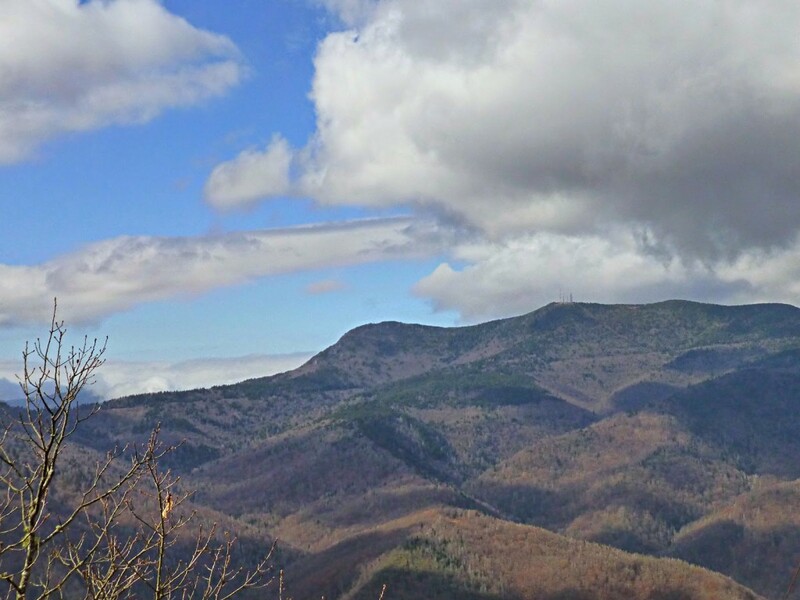 In early November, we had the chance to hike with friends on one of the Blue Ridge Parkway hiking trails, to the Green Knob Fire Tower. This is a special spot for us since you can see Green Knob and the fire tower from our orchard at the Inn on Mill Creek B&B. trail since the tower’s restoration was completed in 2013. So, on to the hike! 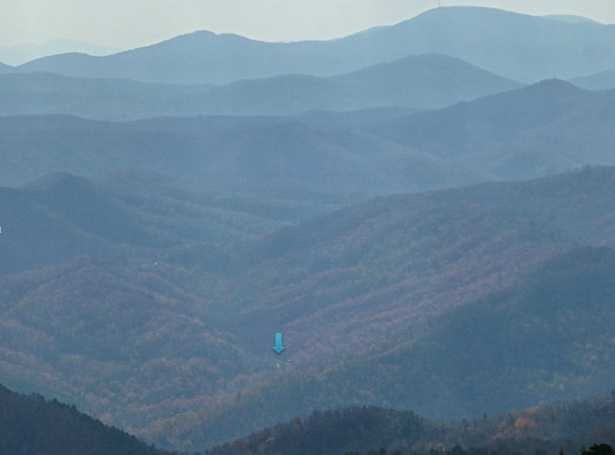 The Green Knob Fire Tower can actually be accessed from the north and south. The hike from the north end trailhead is a few miles long. 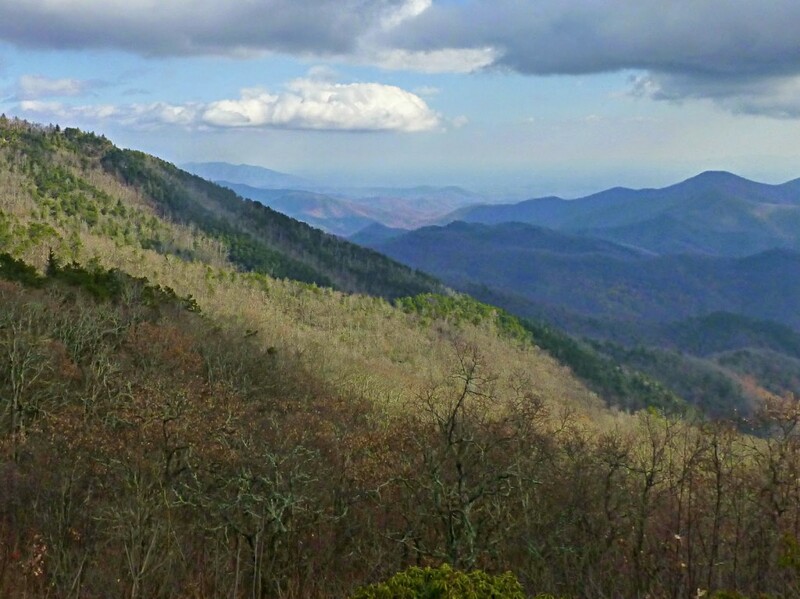 The hike we did was the shorter trail from the southern end, heading northward from the Blue Ridge Parkway Green Knob Overlook parking area near Blue Ridge Parkway Milepost 350. Speaking of overlooks, here’s a view from the Green Knob Overlook in springtime, and then in the fall, past peak fall color time. The overlook view is to the south, on our area around the towns of Black Mountain and Old Fort. To access the trail, facing the roadway with your back to the overlook, you turn right and walk a short distance (roughly 100 yards) along the Blue Ridge Parkway to the trailhead, which is across the road. 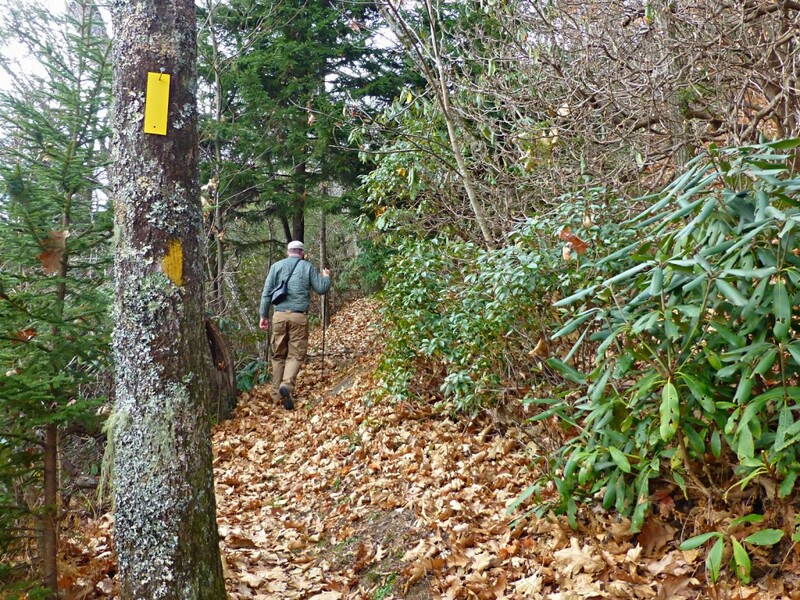 The trail to Green Knob Fire Tower is blazed in yellow (trees have yellow tags on the trunks near eye level), and is a well-maintained trail, thanks to the North Carolina High Peaks Trails Association. 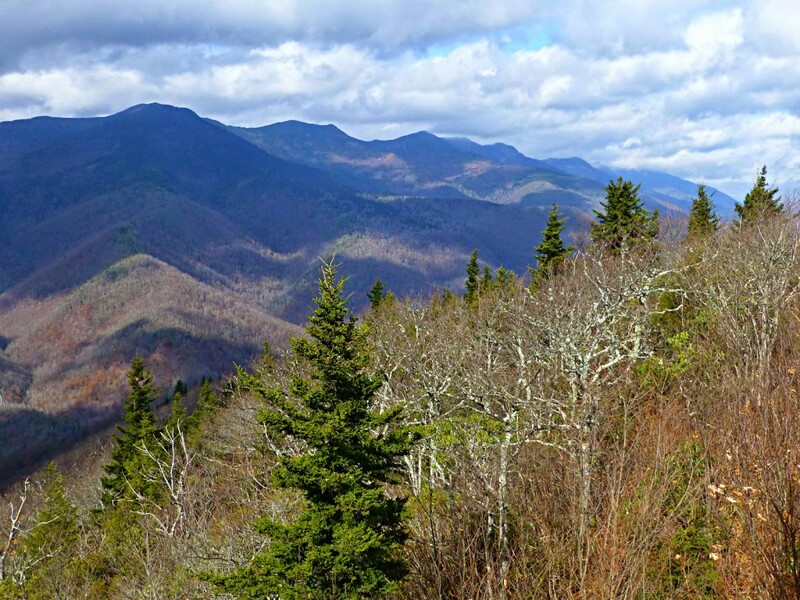 The Green Knob Fire Tower trail from the Blue Ridge Parkway is considered moderate to-strenuous, climbing more than 300 feet over a half mile. Most of that is along gradual incline switchbacks, so it’s not terribly steep. 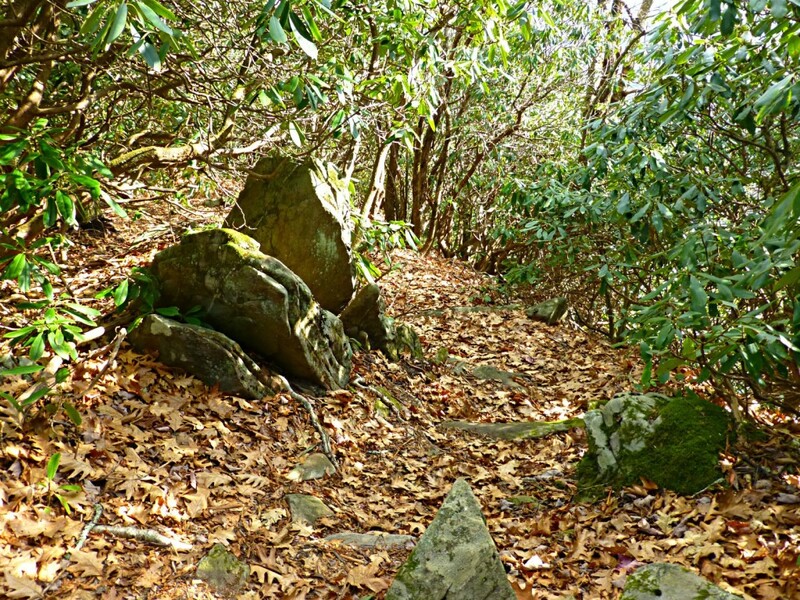 You will definitely feel the incline, however, and you’ll want to watch for tree roots and small rocks under your feet, a common characteristic of trails along what are some the oldest mountains in the world, the Appalachians. Additionally, in the fall, take note that the trail may be covered in an abundance of leaves and acorns, which may cause you to slip if you’re not paying attention. 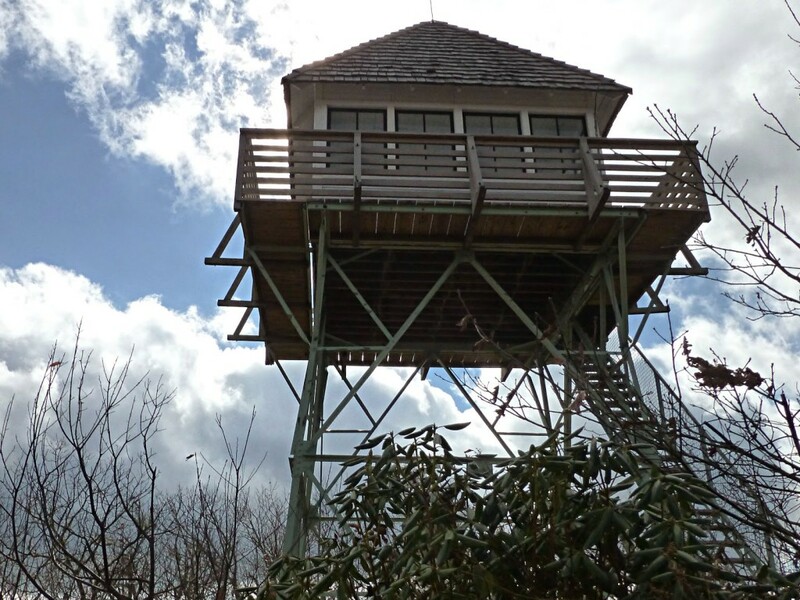 The fire tower was built by the U.S. Forest Service on Green Knob Mountain for a reason: Once you reach the fire tower, you’ll be standing at more than 5,000 feet above sea level with some of the best views of the Black Mountain range, which includes Mt. Mitchell, the highest peak in the eastern United States (and a few of the other tallest peaks). Looking northwest…Mt. Mitchell on the left! The fire tower was originally completed in 1931, and members of the Forest Service served as lookouts in the fire tower until the 1970s. Unfortunately, since its restoration in 2013, the top of the tower and its viewing platform has been closed to the public. But you will still have great views from ground level. to the Green Knob Trail on the Blue Ridge Parkway, we recommend heading east to Old Fort and taking Hwy 70/Main Street east to Hwy 80. Turn left and take Hwy 80 (curvy!) north to the Blue Ridge Parkway, about 12 miles. 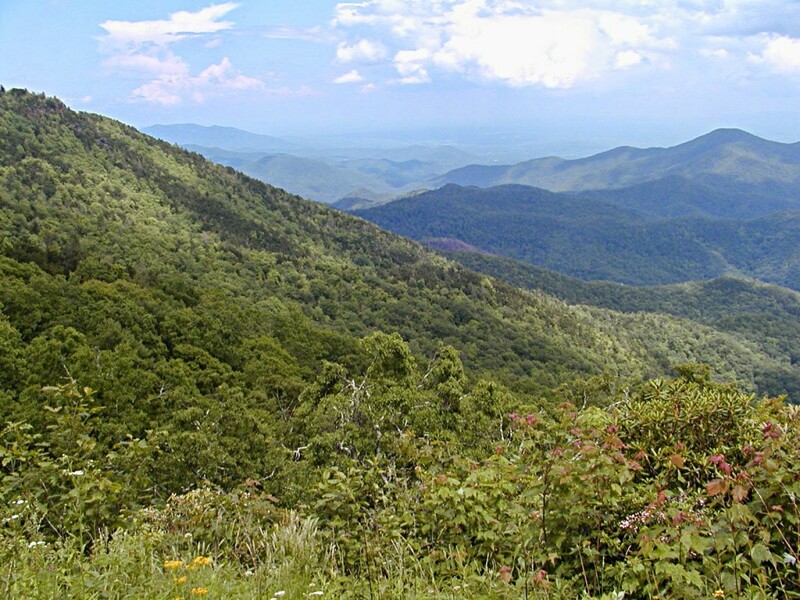 Turn left to head south on the Parkway, and the Green Knob Overlook will be about six miles south, at Milepost 350.4. It’s about 45-50 minutes from the Inn driving through the mountains, but the straight-line distance is just a few miles as the crow flies. So while you’re there, if you have binoculars, take a look out on the right side of the overlook toward the mountains after the foliage is off the trees, and you may catch a view of our B&B! This entry was posted in Uncategorized and tagged Blue Ridge Parkway, hiking, outdoors by Inn on Mill Creek. Bookmark the permalink. Green Knob Tower is such a great hike and a unique destination. I love the fact that you can see your B&B from it. How cool is that!